The schedule makers couldn't have done a better job of pitting Marquette against Georgetown this Saturday afternoon at the Bradley Center. The Hoyas, tied with Louisville for first place in the Big East, have won three in a row. Marquette, winners of five straight, are surging and looking to secure favorable seeding in both the Big East tournament and the NCAA tournament. This game is huge for Marquette, and Georgetown needs the win to stay in the running for the Big East championship. Tipoff is scheduled for 1pm CST. The game will be broadcast on CBS. Here's hoping Clark Kellogg comments on Marquette's "spurtability" early and often during the broadcast. To win this game, MU must force turnovers and dictate a quicker pace to create (hopefully) easier opportunities against the stingy Hoya defense. Saturday is also National Marquette Day. If you are unable to watch the game live, then get out there with alums in your city and watch it in a group setting. We Are Marquette! Media Updates - tons of links! Here are the Top Five Numbers to Know about Georgetown. As always, information comes from Pomeroy's Scouting Report and Game Plan. Basically, Georgetown is exceptional at two things... making and preventing two-point baskets. Even more troubling, there are a lot of the similarities between the areas of expertise for UConn, Louisville, and Georgetown. All three teams do well at effective Field Goal defense, two-point field goal defense, and blocking shots. This is a real concern for Marquette, and we expect that everyone should just prepare themselves to watch our half-court offense look very ugly. However, there are some definite opportunities. Marquette has been outstanding at forcing turnovers lately, and our ball-pressure could really challenge Georgetown's guards. If we're able to rattle the Hoyas into more turnovers than they want and make this into a transition game, then the Bradley Center crowd will start rocking. In addition, Georgetown has had some rough patches lately that suggest potential weakness. Certainly, the fact that they were beaten soundly by Louisville, and needed a controversial call in order to defeat Villanova, indicates to the casual observer that Georgetown may not be playing particularly well. It is certainly true that Georgetown has not been playing as well recently as they represent for the entire season. Don't get too confident, however. 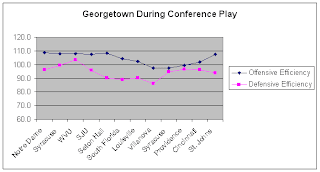 The Hoyas appear to be getting back on track both offensively and defensively with trends that are headed in the desired directions (at least for Georgetown). The good news is that Marquette has been playing great basketball as of late. Marquette is streaking, and unlike the Hoyas, we are playing better right now that we have been for the entire season. Note that Marquette's efficiency for the year is completely comparable to Georgetown's. In front of a rabid home crowd and a national audience, it could be a very enjoyable Saturday afternoon. Love the stats. Is it possible to show Marquette's Offensive and Defensive efficiency against common opponents on the same chart as Gtowns? Big game tomorrow. I think it will really say what kind of tournament we can expect. Thank you. Good question. Hard to represent them both on the same chart, so I'll just write it up. Everything listed below is Efficiency Margin (Offensive efficiency - Defensive Efficiency). We're both sort of beating up on the same teams and we both got worked by Louisville. GU did better against UConn, WVU, DePaul, whereas MU did better against Pitt and Nova. And yes... I think tomorrow tells us exactly what kind of post season we can expect.